Climb aboard The Trafalgar Lane Residence, a beautifully presented, two-bedroom, main door apartment just a mile from Edinburgh’s historic naval heart of Leith. Shipmates are welcomed in to this charming little abode, complete with two bathrooms, parking, and an outdoor seating area. However, those without their sea legs can rest assured that this apartment is firmly anchored, and the perfect base for exploring the whole of Edinburgh. 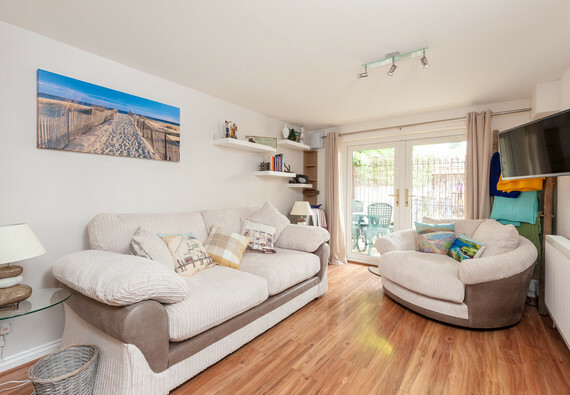 The light and airy living room plays host to sumptuous sofas, large flat screen TV with Freeview and Netflix, and thoughtful homely touches from the owner, including books & games and blankets for the outside area. The fully fitted kitchen is equipped with everything you need to rustle up some culinary treats, and a small dining area provides further seating. Just off the living area is a cosy little covered outdoor retreat, with patio furniture, lighting, and a heater so that it can be enjoyed all year round. A good sized master bedroom allows for a peaceful night’s rest in a double bed, with plentiful guest storage and an en suite shower room. A small second bedroom sleeps one or two guests on single bunk beds, perfect for adults or children, and a comfortable sofa bed in the living area is able to sleep two further guests. A family bathroom with shower over bath completes this delightful home from home. The apartment also benefits from gas central heating and double glazing. Amenities include unlimited broadband, Freeview TV with Netflix, CD player/radio/iPod station, washing machine, iron and ironing board, highchair & hairdryer. There is also a hard wired smoke alarm and first aid box. The Trafalgar Residence is located in a quiet residential area just two miles from Princes Street and The Royal Mile, and a few minutes from The Shore. For those visiting with a car, one private parking space is available for guests’ use, in addition to unrestricted on-street parking in the local area. Several buses run regularly to the City Centre and The Shore from behind the property on Ferry Road. *** smoking is permitted only OUTSIDE of the property. Smoking is prohibited within the property. Exterior The apartment forms part of a small, modern development within a quiet side street. Interior layout A central hallway leads to two bedrooms, one with en suite, a family bathroom, and open plan living/dining/kitchen area with private patio. No reviews yet for The Trafalgar Lane Residence.